The surprises just don't stop! The mailman in my neighbourhood is always very late in dropping off mail. It is rare that we receive mail before noon. Today, whilst working on something, my housemaid came into the study to hand me a parcel. Of course I love receiving parcels - beads/components/anything..........I just love parcels! Today, I received this amazing bracelet from a 'new' friend. I've admired her work from afar, seen her around on flickr and facebook but never really interacted with her till very recently. She is a good friend of another of my friends - Lis, the cutie of saplanet fame. Once again, I fell for one of Lis' "May I check if there is sizing for wrist/bracelet? I am planning to get a bracelet for a friend, but not sure if there are standard sizes like ring sizes"
I should have known better! I went into a long spiel about the standard sizes for Asian girls etc., etc., hmmmmm....crafty little Lis! Anyway, its all good! I am so happy to receive one of Cynthia's masterpieces. 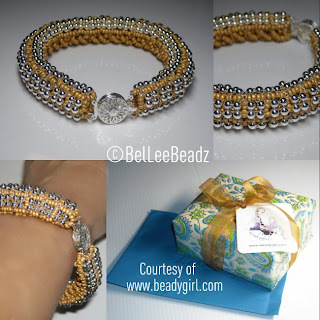 Love the matte gold and silver tone and its allowed me to see close up the intricate beadwork that Cynthia excels in. Thank you Cynthia! And dear Lis.....hmmmmm....Thank you for being the intermediary!! So, you have found out the sweet 'conspiracy' after all. You were too helpful with the sizing, I had to beat about a giant bush to get your wrist size! A bird told me that the beads are specially brought in just for a very special birthday girl, and I wonder who that special girl could be.. haha..